If you’re only knowledge of Norse gods revolves around the numerous appearances of Thor in comic-themed feature films, that gives you a leg up on most people in the modern world. 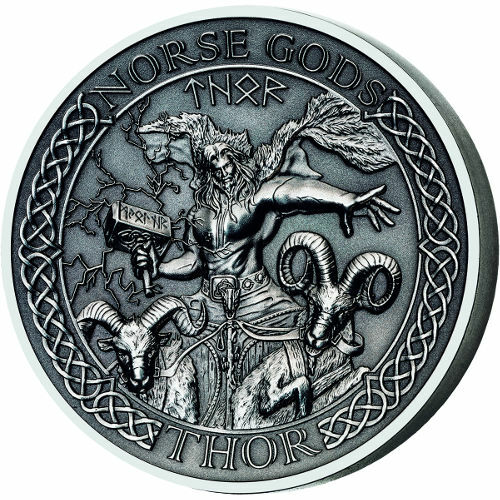 The BH Mayer Mint is capitalizing on the popularity of Thor and Norse mythology in the modern climate with the introduction of a special ultra-high-relief coin series. 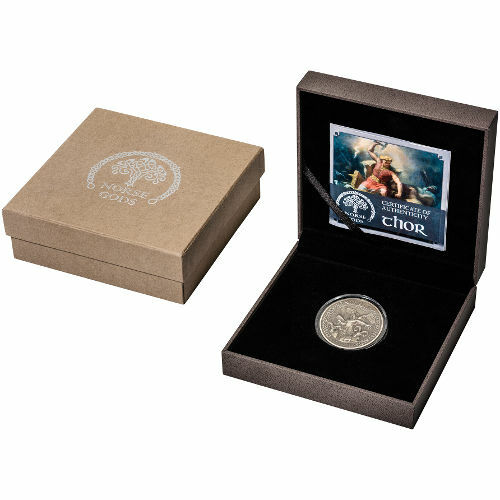 Right now, the 2015 2 oz Silver Cook Islands Norse God Thor Coin is available on Silver.com. Extremely low mintage of just 1,000 coins for global distribution! 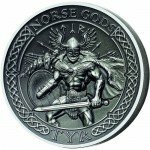 Second coin released in the Norse Gods Series. 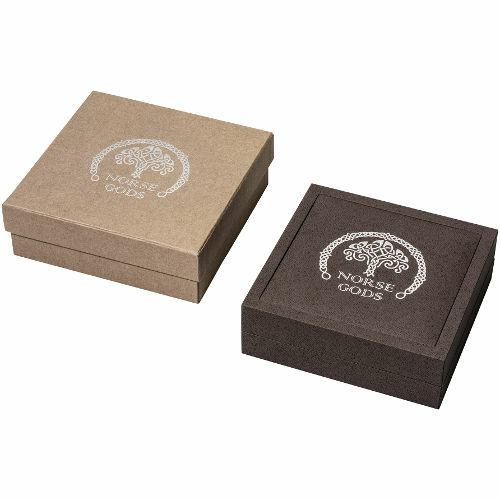 Coins ship in presentation boxes and come with a Certificate of Authenticity. 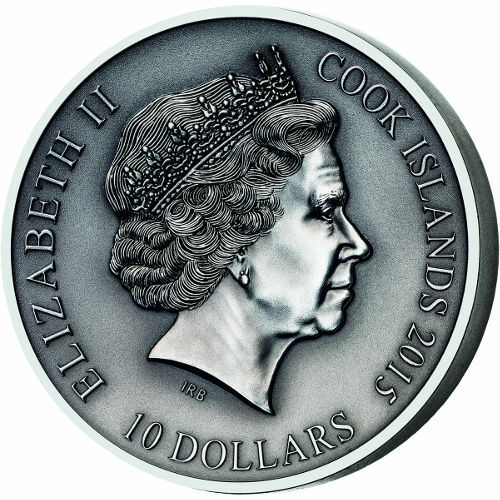 Issued a face value of $10 that is considered legal tender in the Cook Islands. Celebrates Thor, the god of thunder, lightning, and storms. In Norse mythology, Thor is one of the more popular gods. He is known as the son of Odin, the father of all gods. Thor’s magical hammer is a well-known facet of comic book storytelling, and in Norse culture Thor is known as the god associated with thunder, lightning, storms, and strength. 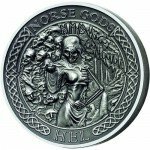 The Norse Gods coin series is a planned nine-coin series from the BH Mayer Mint that features antique finishes and ultra-high-relief striking. Antique finishes bring a warm, subtle accent to the finish of any modern coin. Ultra-high-relief proofs are coins struck upwards of nine times under immense pressure, creating a distinct 3D look and feel to the design features. On the reverse face of these silver coins is the image of Thor wielding his infamous hammer. 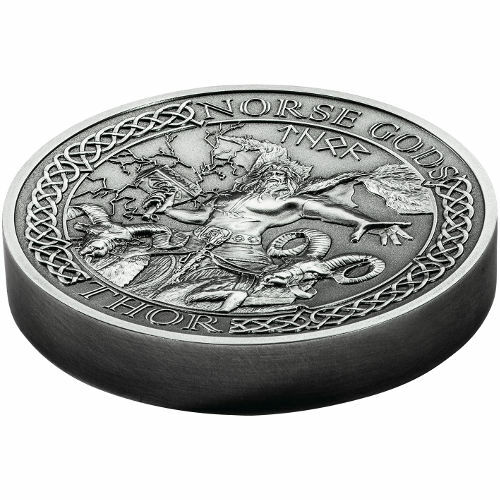 This is the second coin released in the Norse Gods series, and includes engravings of “Thor” in both English and Norse, with the words “Norse Gods” along the top as well. The obverse face of the coin features Ian Rank-Broadley’s 1998 right-profile portrait of Queen Elizabeth II. Her Majesty’s profile is featured along with the engravings her name, the nation of issue, year of issue, and the face value of the coin. The BH Mayer Mint is located in Germany, where it was founded in 1871. 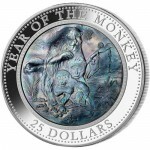 A privately-owned minting operation, the company is currently under its fifth-generation of leadership, and has developed a reputation for excellence in the industry. If you have questions, please contact a Silver.com associate at 888-989-7223, chat with us live online, or submit your questions via email.